In my quest for better health and losing some unwanted pounds, I have decided to cut sugar out of my diet for a while (and drastically cut down thereafter). I don’t remember having all that much of a sweet tooth as a child or teen but somehow about 3 or 4 years ago, I developed this unwelcome need for sugar. Nowadays, the cravings attack at night, perhaps because I am tired, but even when I am in bed, drifting off to sleep, the sugar monster takes over my brain and tries, sometimes successfully, to convince me that I ‘must’ satisfy my cravings. The real issue is that the sugar monster has triumphed way too many times over the last couple of months, to a point that I feel a loss of control like a drug addict, and there have been, I am ashamed to say, occasions where one could find a half eaten packet of biscuits in my bedside cabinet. Now, I have been particularly stressed lately, with exams, essay deadlines, research, bad news, too many long car journeys and you know, the day to day stresses of living that I’m sure I don’t need to define. I could put it down to that, but I am more inclined to ‘blame’ the addictive nature of sugar which I have only recently learnt about and am sure I have been under the spell of the sugar rush. This of course means that, as with any addiction, cravings and the ‘need’ increase in times of stress. Further support for this comes from the fact that I can trace the beginning of my sugary craving back to when I started baking. I am no expert on this issue, and there are very conflicting views floating around the internet, ranging from the idea that all sweet tasting foods must be eliminated including fruits and vegetables and natural sweeteners such as stevia to, artificial sweeteners are a better option, to just cutting out sugar by way of sucrose is enough. For me, I am going with the latter, I am still using stevia and fruits and vegetables but cutting out all forms of sucrose sugar. I strongly believe that with any ‘diet’, for long term ‘success’, there must not be a feeling of deprivation. That goes for me anyway, who is one who, if on an Atkins diet, would eat a bakery full of bread after a week. But, allowing myself a little sugar every now and then isn’t going to work if what the scientists say is true, that I have some kind of addiction. You wouldn’t recommend a recovering alcoholic have ‘just one glass’ would you? To combat this issue, I have found ways to satisfy my sweet tooth and give myself a comparably low calorie treat that is so satisfying and is working to end the cravings. One example of this is this peanut butter hot chocolate. I came across a recipe by A Girl Called Jack a couple of weeks ago, which I just had to make a vegan and sugar free version of! It is so simple, so delicious and you will never feel like you are not consuming an unhealthy amount of calories and sugar. This is not diet food. But virtuous enough for your diet. I’m looking forward to trying it with almond and hazelnut butter too. Pour into your favourite mug (mine has a chip in) and enjoy. 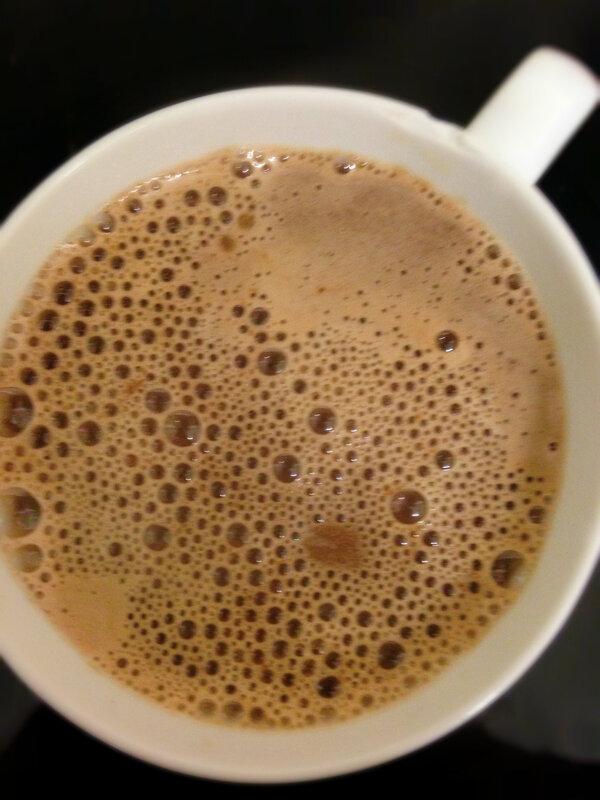 Do not just add all the cold milk to the melted chocolate as this will cause the chocolate to solidify leaving you with floating little lumps of chocolate and not a smooth, rich, creamy hot chocolate. 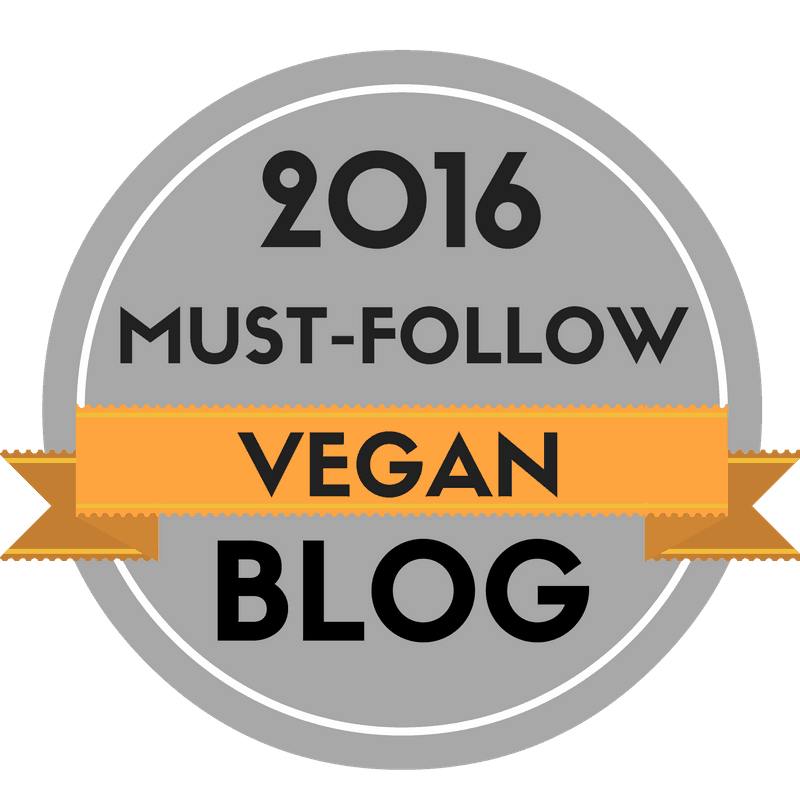 This entry was posted in Chocolate, Drinks, vegan, Vegetarian and tagged chocolate, dairy free, drinks, healthy, sugar, sweet, vegan, vegetarian. Bookmark the permalink. Chocolate and hazelnut butter… that would be an amazing combination! Sounds yum! And love the heart spoon. Wow! Good for you for eliminating sugar entirely for a year! That’s really inspiring. I agree, after just over a week, I already feel so much more energetic and brighter. Looks great! 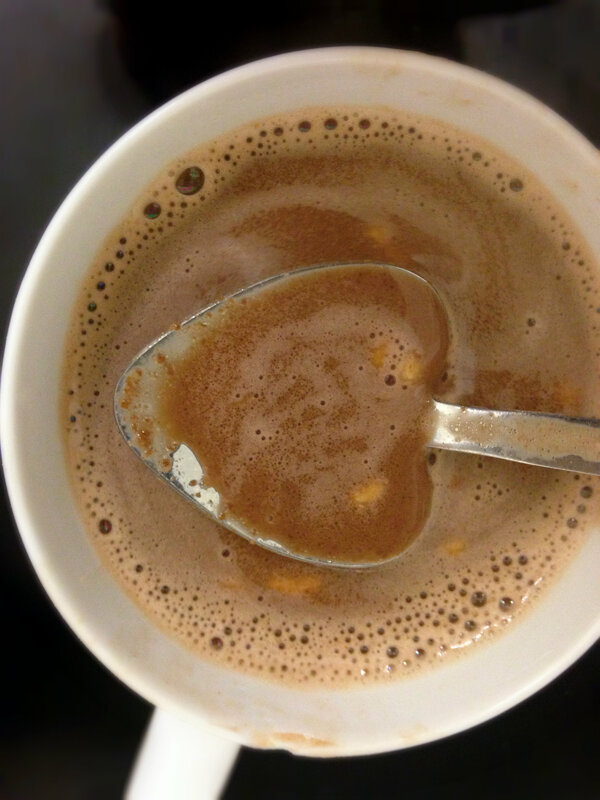 I have been experimenting with peanut butter hot cocoa. It’s such a delicious combination isn’t it! Wow that sounds great. I’m trying to eliminate sugar too! Wishing you every success with your studies! Thank you so much for your kind wishes! Good luck with your plans to eliminate sugar too, I am amazed how much better I feel after a week. I really didn’t realise how much it was affecting how I felt. Never thought about peanut butter in hot chocolate, love this!!! We’ll have -20 with wind chill tomorrow, I think I’ll make this when I get home from work. Thanks!! It was delicious! My husband love it too ! Thanks. Peanut butter. That is a unique idea. I’ll have to try this. Thanks. This sounds amazing! Nice little treat for satisfying cravings. Hopefully it’ll keep me away from the cookie jar! This recipe looks amazing!! I’ve been thinking about cutting cane sugar out of my diet too for a couple of months, as it makes me feel very sluggish. This recipe definitely looks like a good place to start because nuts are naturally sweet and I love anything with chocolate! Great post! Good luck to you too Priya! Are you cutting out all forms of sugar or still using things like fruits? It’s so true, we do just get used to changes in our diet and our tastes change! 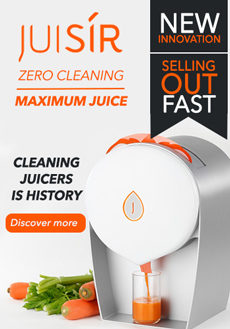 We just have to go through the initial cleanse to get there which is the hard part! That looks so decadent! I’ve just learned making almond milk too. Love your heart shaped spoon!! This looks delicious! I have a sweet tooth and always did. As I got older my sweet tooth subsided a bit. I realized that when I was stressed, sweets would give me comfort. I’ve since found healthier alternatives. Thanks for sharing. Hi Sharon, thank you for sharing your experience with sweet foods! I was the opposite, my sweet tooth increased as I got older! I definitely understand the sweet comfort in times of stress! I have already found that there are ways to get the same comfort in a healthier form in just a sort time! I’m also going no sugar (I’ve been using unrefined sugars only for a couple of years, but…sugar is sugar) – limiting myself to stevia, dates, or fruit for sweetness, so I totally understand the cravings! I think I’m over the hump, however. You are absolutely right that total deprivation winds up making us mess up later, so you have to have some healthy indulgences now and then. This looks terrifically delicious! PS your site looks great! Very sophisticated. Yes, me too but as you say, even the organic, natural, totally unrefined stuff has the sugar effects! So far, I’m feeling OK, I am so determined that I’m getting through the cravings better than I thought and they are definitely decreasing. Like you, I am using stevia, dates and fruit to sweeten and really don’t feel at all deprived at this point! Good luck! Now, at home, I only eat coconut sugar because it is low-glycemic or dates! Sometimes, I use a bit of maple syrup though. I am not a big fan of agave or stevia! Thank you Sophie! I LOVE dates to sweeten especially when I can get hold of a bottle of pure date syrup as it can simply replace maple syrup or honey or whatever in a recipe. For the next few weeks I’m going to stick with dates, stevia and other fruits to sweeten then I will reintroduce maple and agave and coconut sugars. I guess it’s a bit of a ‘cleanse’ really. Reblogged this on Ginger Bake. Hi Sylvia! I think after a few weeks I will start using maple syrup and other healthier sweeteners but for now I need to ‘kick the habit’! The good news is that by not eliminating fruit sweeteners I can still use dates and date syrup to sweeten as well as stevia so I don’t feel restricted really! I lasted three weeks on a sugars free diet, until I could take no more. Good luck! That sounds great. I drink a lot of tea but with this cold weather, you need something more indulgent! 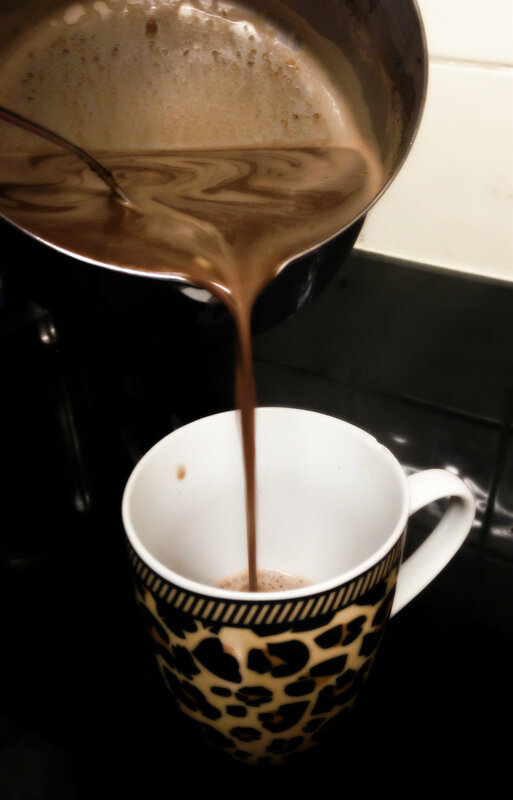 Definitely, sometimes you just need to cosy up with a good mug of chocolate!! This sounds delish Poppy! I’ll have to try it when I don’t have to get up early the next morning. 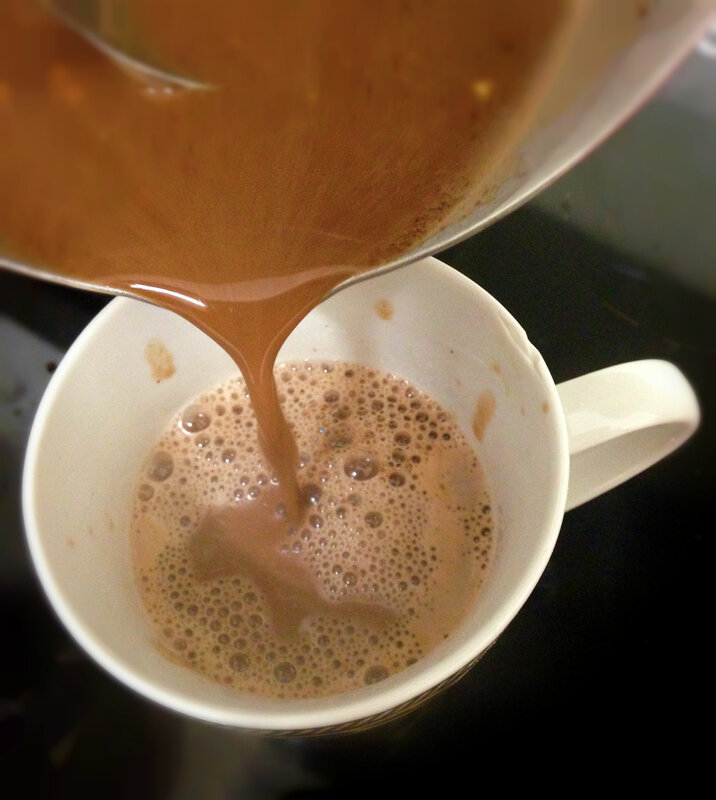 I used to make date-sweetened hot chocolate as my go-to healthy dessert, but the caffeine keeps me up at night. Recently I’ve been on a sunflower seed butter no-coffee latte kick. I just whirl a tablespoon of sunflower seed butter, 1 or 2 medjool dates, almond milk and a splash of vanilla extract in my Vitamix until the date(s) are liquefied. Then I heat it up on the stove to get it nice and hot. It’s delicious! And if you use a low cal almond milk and just 1 date it’s under 200 calories!!! Celeste, your sunflower seed butter no-coffee latte sounds amazing, I bet it is deliciously creamy and nutty! I will definitely be trying that, thank you! I hear you about the caffeine although I don’t really get affected by chocolate or even coke, only coffee really affects me. Just read Celeste’s post and thought again about how much I would love a Vitamix but since I do not have one, I have heated pitted Medjool dates in a saucepan with a bit of water and mashed them until they broke down before using them in any blended drinks etc. I also eliminated refined sugars from my diet over a year ago and I completely agree with you Poppy, substituting addictive white sugar with other healthier alternatives is satisfying and rewarding. I make all my own desserts at home now, from “nice creams” to cakes etc and I have been able to stay away from commercialized, and other desserts that are full of white sugar without feeling deprived. When I need a granulated sugar, I use coconut sugar but I do not use that often and stick with fruits, maple syrup and honey (not technically vegan but I am ok with that). A good friend of mine has a blog site dedicated to sugar-free recipes – I have a link at the top of my blog to her site (sweet sugar free life … I hope I’m getting that right – now that I have a link to her, I don’t keep it straight in my head, lol, but like I said, it is on my site). Happy sugar-free cooking – stay strong!! Looks like my cup of tea…er…chocolate! Great idea with the peanut butter and so simple! I adore pb but can’t say I had it in hot chocolate! Btw thanks for liking my post on pumpkin dip! Hope to see you again soon on my blog! Thank you! It is just what you need to warm you up! Oh gosh, who wouldn’t love this?! thanks. Thanks Rhonda, I hope you love it! You know what they say about great minds 😉 Haven’t tried almond butter yet but I bet it was delicious! Sounds wonderful! I just had my wisdom teeth pulled so I have to have liquids and soft things. This might spice up my choices, thanks for sharing!